Last week was sort of a bust... literally. I was trying to whip up some healthy wheat, zucchini muffins for me and Cason and accidentally 'busted' my glass sugar jar on the edge of the counter. Stupidly, my initial reaction was to catch the jar (to save it, because I LOVE the style of these canisters so much and they're hard to find) but once I did so, I realized that that wasn't such a great idea. Ack! Let's just say that the shock of finding an instant small pool of blood on the floor, from a pretty gnarly cut in my hand, was enough to almost make me pass out. In true blogger fashion I snagged my phone to document the mess, until Cason yelled at me to stop walking around because I was leaving drops of blood everywhere. I tried my hardest to get the bleeding to stop on it's own, but by the next morning I had come to terms with the fact that I was probably gonna need a doctors help in that area. So a few hundred dollars, (a slight infection from waiting too long to get my cut looked at) and a couple of stitches later (my very FIRST stitches EVER, to be exact)... I was back in business. We were right in the middle of painting our basement and we'd both been going back and forth on who should take the daunting task of painting baseboards. Well, since it's sort of a one-handed job, guess who got it? uuuugh. To be honest, I was actually okay with it because it meant that progress was still being made and that's all that mattered at this point. Also, I feel like painting baseboards is a lot like folding laundry, doing a big sink-full of dishes or vacuuming. You dread doing it initially, but once you get started, it's oddly therapeutic. Maybe it's because it's a mindless, time consuming task, but either way... it hasn't been too bad. Don't get me wrong, it's not my favorite thing to do (far from it, actually), but about 20 minutes into it I was REALLY happy I at least had the tools I did, that made the whole 'baseboard-painting-process' move a lot quicker; so I thought I would share some of those tools with you as well! 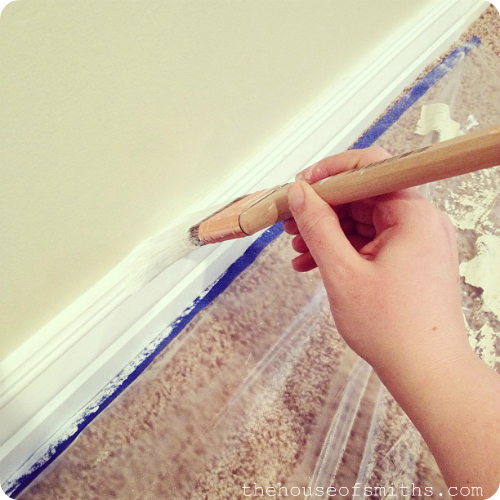 We covered a few of these tips in our how to paint trim work & moldings post, so you can check that out if you want too. Basically there are 3 key things to remember when painting baseboards. Around here, we're big fans of Purdy paint bushes. We've used a few other brands in the past, but find that we keep going back to the Purdy ones. Are they a bit more money? Yes... but if you wash them out after each use and hang them bristle-side down to dry, they will keep their soft feel and perfect shape for a really long time. For baseboards, the only brush we use is an angled brush. Ours is about 2 inches but they have different sizes, so you can pick what you need depending on your baseboards width. We get asked over and over and over again, "What sort of paint do you use and in what sheen?" Well, in a nutshell, we love them ALL for different reasons and the sheen depends on what job you're doing. For walls, we always use SATIN and for our ceilings, FLAT. As for ANY and ALL molding and trim projects, we use BRIGHT WHITE, straight from the shelf, SEMI-GLOSS latex paint. The only thing that we have our hardware/paint store do, is shake it up for us in their handy paint-shakin'-machine because after a while of sitting on the shelf the paint can separate a bit. We've found that it doesn't matter WHAT brand your bright white is, they're all pretty much the same. (I'm sure someone will disagree, but alas, that's our take on it). 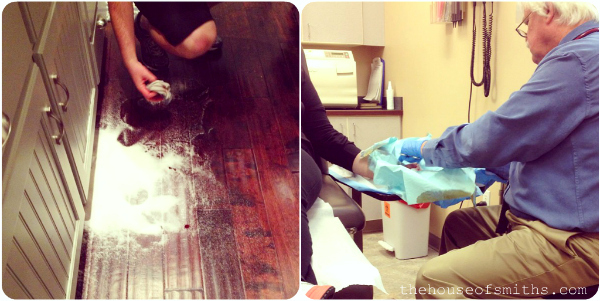 Just be sure you're NOT snagging any semi-gloss from the shelf that has tint added to it. 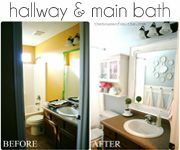 I did that once and realized halfway through my project, that the wall looked really gray (because it had a gray tint/base in the paint, to assist darker colors like red and black. UGH! What a pain!) Always make sure the can says Ultra-White or Bright-White. Our go-to paints for budget purposes are usually Glidden and Olympic. They tend to cost less than most and still do a great job! Valspar is a bit pricey, so we usually don't use it for trim paint, but we DO like it for vibrant or dark paint colors; it's very rich and has a great finish too. We've used Behr paint before and found it really similar to Valspar, except we didn't love how the paint dried. Even with primer + paint, we still found that we had streaks or roller marks afterwards. Sherwin Williams is another paint brand that we love (not pictured above). It has AWESOME coverage but can also be quite pricey. That being said, they have the BEST customer service, along with coupons and sales ALL the time, so if you sign up for those and hit the timing just right, you'll be in luck! To sum it up, for us, we typically choose the Glidden brand for most of our painting projects. Their color selection isn't quite as large as some others, but we've always been happy with the result and price. One thing to note, is that Glidden dries REALLY differently than other paints. It will almost appear that you've missed spots, but in reality, you haven't. The paint tends to go ON light, appear a bit darker while drying, but then once everything is cured and set, it lightens back up again to it's original shade and evens out. Maybe it sounds crazy... or maybe WE'RE just crazy, but that's our honest opinion in what we've noticed. I have to give Cason ALL the credit for this next one. You guys, this stuff is AWESOME! I tried to explain it to someone in an email and failed horribly, so here's a demo picture of how the product works. 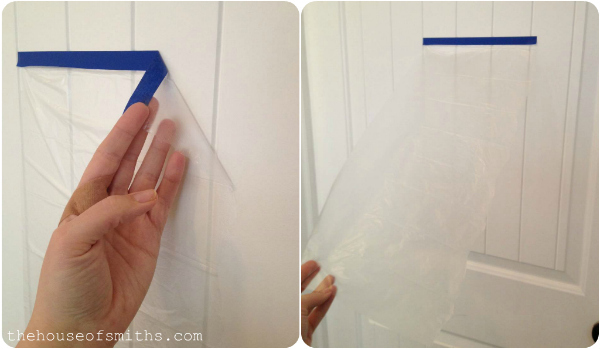 Think Tape + Plastic sheet... ALL in one! I put a piece on the door, so you could see how it works. Basically, the 20 or so inches of plastic is ALREADY attached onto this thin piece of painters tape, so you apply the tape down onto your carpet/hardwood/tile, and then stretch the plastic out to protect your flooring from splatters or paint streaks! Genius!!! The next tool is a large paint guard, like the one pictured below. I've talked about this before in our post about our 10 Must-Have Painting Tools, but I'm bringing it up again because it's SUCH a time saver. These guards come in all sizes, but the long ones are awesome for baseboards because you can paint more footage without having to move the guard so much. Usually these tools are made out of silicone and metal (both easy materials to wash paint off of when you're finished). Here's a diagram of how I would use the guard. Because I only had one hand to use this time around (stupid cut), I didn't have the ability to use the guard on the top of the baseboards. Instead, I just used a steady hand and cut-in (or free-handed) the paint on the top portion. 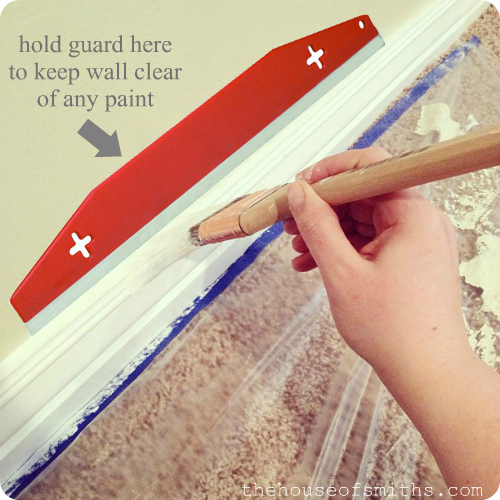 We have a pretty thick ledge on our baseboards, so it was really easy, but if you are wanting to speed the process up even more and make SURE you get the straightest line possible... then I recommend using the guard. We've finished up all of the painting (for now, anyway), and we're ready to start adding special touches and get moving on decorating! We've got a pretty clear idea on how we want this space to look, as far as colors and styles go and we're excited to show you soon! I know what you mean about those dreaded projects. I have 2 rooms of wallpaper that I have lived with for 18 months now! That's our next project, maybe! Ooh--thank you so much for doing this post! 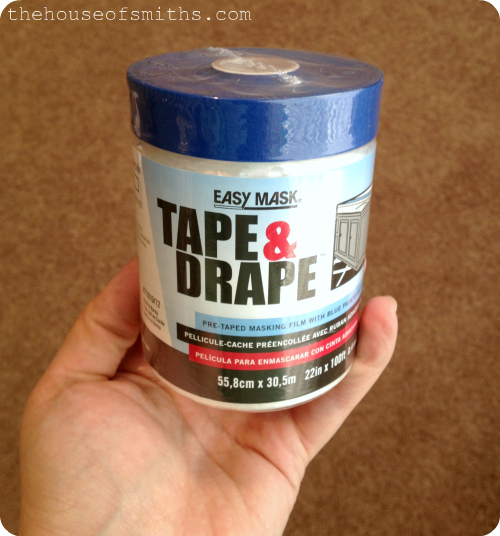 I can't believe I've never heard of Tape & Drape! 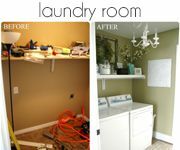 We have a bunch of baseboards waiting to be painted, and this method will make it so much easier!!! Yay! Do you have tips for how you wash out your brushes? It always takes me forever and I keep wondering if there is a better way. Thanks for all the paint tips! I always use SW.
Great Post! Are all the bright whites the same color or once you pick a brand you should stay with the same one? Great tips Shelley! You answered all my questions! Thanks!!! Off to paint store now! Thanks for all of the tips! Painting the baseboards is really something that I need to tackle in my home but I don't want to!! Ah! thank you for the detail you put into your blog! I Love it! 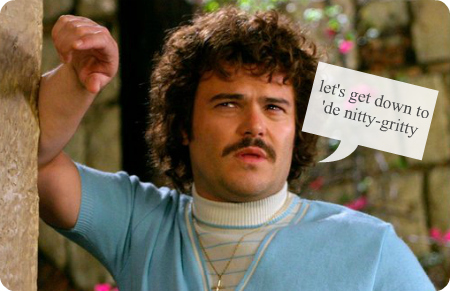 Especially the extra whit & cuteness you always add--- Love the Nacho Libre' picture!!! Great info, thanks! It was my job to caulk and paint the baseboards in our house...I was dreading it but you are right it was therapeutic! I'm sorry to hear about your hand, but I'm glad you're ok! Do you have any tips on mixing your paint at home? Last night I used a can of paint that had been sitting for a few weeks. I mixed it with the stick they give you, trying not to whip air into it, but when I poured it out there were so many air bubbles it was practically unusable! This could not have come at a better time! I'm so wanting to paint our living room and hall but we have been procrastinating because of the amount of time it takes. These tools will come in handy and help me convince my hubby that we should do it sooner rather than later. Thank you so much for your tips. I need that guard! I'm painting built ins now...and I think of you every time I get started. What a BEAST those things are. 2 are done and I'm workign on 3 upstairs now. They are worth it when they're done, but sheesh....a LOT of work! Thanks for the help! 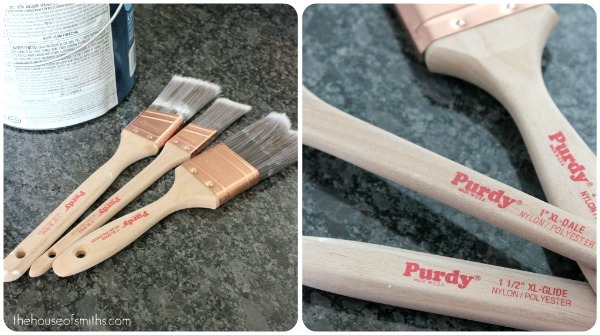 I too LOVE Purdy brushes!!!! The best! Where did you guys get your paint guard? I will have to try that tape & drape and the paint guard when I touch up our trim upstairs. It's funny timing with your post- we are painting our moldings and trim in our basement in a few days but will be using a paint sprayer since there is no carpet. Thanks for the ideas! Glad your hand is okay! :) Great idea on the guard. :) Can't wait to see it soon. Sorry about your hand Shelley. I've never gotten stitches either (knock on wood). I hope you heal quickly. 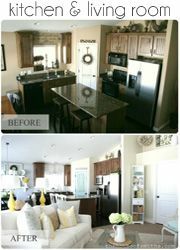 Great tips, I am definitely going to purchase the tape and drape as well as that paint guard. Thanks for all the instructions and tips. There are no more excuses for me to put off painting my baseboards! Currently in the process of trying to convince my husband we need to paint the trim in our house white- It's currently 1990's light maple, along with our cabinets I'm also wanting to paint. His biggest concern is that they'll scuff or show nicks really easily if they are bumped into. What's been your experience with this? Any advice? Thanks! This post couldn't have come at a better time! very cool. painting baseboards is in our future, i'm sure. thanks. I need one of those guards. Do you have to wipe it off after each time, or do you just keep sliding it down? 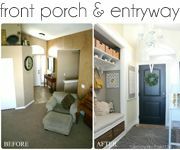 It seems like it would be helpful for door molding too. Must get one! Do you prefer silicone or metal? Basement looking very very lovely, however! Inspiring. Basement looking very very lovely, however! Inspiring stuff. Hey Shelley, I just painted my baseboards last weekend, which were previously stained, and we actually used Ben Moore's Satin Impervo paint...it's oil based, but is supposed to prevent the baseboards from stripping off of previously stained wordwork. Have you had any issues with the latex? My dad's a contractor and has had way too many issues with the latex paint on previously stained trim...so we went that direction. It was EXPENSIVE paint--regularly $70/gallon, but my dad got it for us for $50. Anyways, just curious. :) It makes SUCH a difference, huh!? I just snorted at your Nacho photo. Also, I hate hate hate painting baseboards. That tape and drape is genius!!!!!! This is kind of irrelevant but where did you get your glass jars? I've been looking for some everywhere! 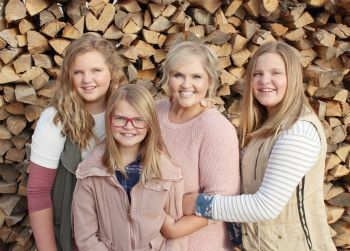 My daughter in law got me hooked on your blog. You are the best. You are a beautiful woman in every way, and I hope your range of influence is huge, especially to other women. You are a very engaging writer. I am an English teacher, and I am always so happy to find good writers who spell well and have great grammar skills; at the same time being able to be chatty and fun. Just checking in to say you're wonderful. You have many blessings, but you are a blessing yourself, and don't forget it! Thanks for all the information! I pinned a lot of them! Hope your cut heals quickly. I would have grabbed for the canister too.